This is a fantastic variety pack that includes: 2 Grandma's Cookies (assorted), 3 Planter's Peanuts (1 oz), 2 T.G.I. Fridays Cheddar and Bacon Potato Skins -1.0 oz, 10 Slim Jims Original- .28 oz, 2 Takis Chips- 1oz, 2 Moon Pie- 2.75 oz, 2 Cracker Jack- 1.25 oz, 5 2pk Oreo/Chips Ahoy- .77 oz, 5 FireBall- .1oz, 3 Rice Krispie Treats, 5 Blow Pops, 5 Fruit Roll Ups, 3 Cheese Crackers, 1 Combos, 2 Stay at Home Snacks Mints! 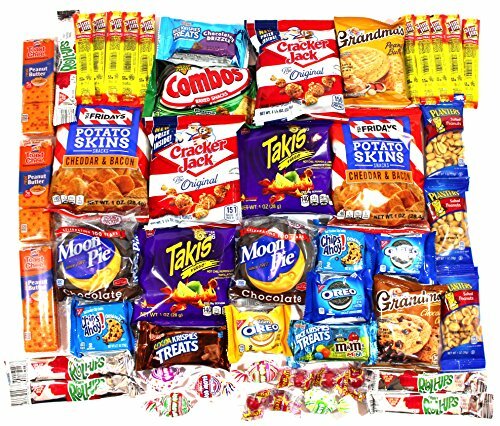 Perfect For College Dorms, Graduations, School Snacks, Businesses, Homes, Gifts, Parties, Sports Teams, Military Personell, & Much More! Variety Pack Includes: 2 Grandma's Cookies (assorted), 3 Planter's Peanuts (1 oz), 2 T.G.I. Fridays Cheddar and Bacon Potato Skins -1.0 oz, 10 Slim Jims Original- .28 oz, 2 Takis Chips- 1oz, 2 Moon Pie- 2.75 oz, 2 Cracker Jack- 1.25 oz, 5 2pk Oreo/Chips Ahoy- .77 oz, 5 FireBall- .1oz, 3 Rice Krispie Treats, 5 Blow Pops, 5 Fruit Roll Ups, 3 Cheese Crackers, 1 Combos, 2 Stay at Home Snacks Mints! Now includes 2 Stay at Home Snacks Branded Mints!